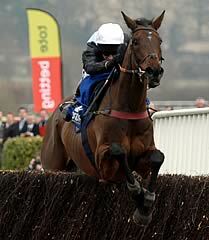 Copper Bleu gave trainer Philip Hobbs and jockey Richard Johnson a second success at the 2010 Festival when capturing the opening Jewson Novices’ Handicap Chase. The pair had also teamed up to win Tuesday’s Spinal Research Supreme Novices’ Hurdle with Menorah. “I thought Dickie was brilliant because the plan was to be handy but of course they went far too quick. The pace was tremendous and Dickie said he was virtually flat out the whole way,” said Hobbs. “This is only his fourth run over fences and he has taken a few runs to gets his act together chasing. He jumped brilliantly all the way. “But on his fourth in last season’s Spinal Research Supreme Novices’ Hurdle, you would have had to give him a chance today. “We have also had another issue with him because he has developed a breathing problem over the last few months and that’s why he had a tongue tie on today. “There is a new 2m 5f handicap chase (the Betfair Novice Handicap Chase) at Punchestown and he could go for that. Johnson added: “We couldn’t go much quicker than we did in the first half of the race but from the water jump they came back to us. Local Slad-base handler Tom George was understandably thrilled with the performance of 50/1 shot Othermix, the three and a half length runner-up in the Jewson Novices’ Handicap Chase. Tom George said: “He has run well and we are obviously all delighted. He is now starting to show the sort of form he had in France and is a horse that will keep on improving. “He ran in blinkers for the first time today and they have just sharpened him up. Trainer Willie Mullins has a totesport Gold Cup contender in Cooldine, and the wellbeing of his chasers was given a boost when The Midnight Club finished third in the Jewson Novices’ Handicap Chase. The nine-year-old, who was ridden by Cooldine’s jockey Paul Townend, was just half a length behind runner-up Othermix, and Mullins said: “We’re absolutely delighted with him. He was flat out from start to finish, jumped great and it was a credit to him that he was able to run a race like that on that sort of ground. Tony McCoy, whose mount Jered fell at the first, was initially attended by paramedics as he lay on the ground, but he was soon on his feet and walked into the weighing room.